Real men are rising up across our nation. These men are not just heroes on display, but heroes to their families – and heroes when no one is looking. These men are learning to become more than conquerors through Christ. You see, conquerors aren’t born – they are made. Leadership starts in the uttermost hidden parts of our lives. More and more men, including Christian leaders, are fighting for their spiritual lives, but do not know how to prevail against the enemy’s assault. Dr. Roberts’ real and raw approach is unique. He takes us through a journey of discovery, laying out spiritual strategies, presenting scientific facts and, in military style, teaches men how to use the weapons God has given them to prevail against the enemy of their souls. Having battled and triumphed against sexual temptation himself, Dr. Robert gets it. His message is bold and direct, but also gracious and loving. 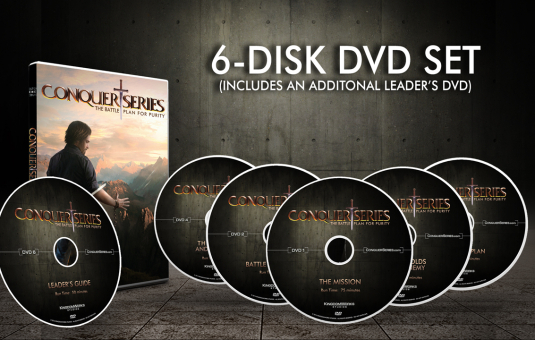 The Conquer Series is a new DVD teaching series for men. Included in the set are five 1-hour long teaching DVDs and a leader’s DVD. This is not just another study tool for men, but a tried and proven battle plan for purity in a lustful and Godless world. a church in Oregon with over 7000 members and has counseled and discipled men for over thirty years. We have condensed thirty years of Dr. Roberts’ knowledge and experience into five hours of simple, yet comprehensive, teaching. Whether they are faithfully staying the course or whether they are secretly struggling with sexual temptation, the lessons in this DVD curriculum are something every man will benefit from. The Conquer Series is designed for men’s small groups, but is also ideal for self-study. Included in each DVD are action-packed cinematic reenactments based on Dr. Roberts’ battle experience, mind-blowing interviews with brain experts and empowering testimonies by famous male Christian role models, who each inspire us to keep fighting and remind us that any man can become more than a conqueror through Christ, regardless how many times he’s failed. Order The Conquer Series Now!